This probably has been covered some where on here at sometime, but I have always wondered why Diamondbacks supports are different colors? Yellow and tan. Anyone have a good explanation of this? I don't have a park answer on this, just IndyGuys guess, but I thought they were different on the first drop since it crossed a midway and adds an extra pop of color for the big lift hill. I got a response and they told me that is something they can not offer but they do realize people want to own some of the parks history. I emailed back and said let everyone know to bring Phantom Theater back! From what I've understood, the supports near the midway are there for that pop of color, but the supports that are the tanish color are there to semi-blend in with the area around them. Well, they had to clear some of it for when they built Diamondback due to them doing some major grading in that area. Remember that the area where the train trestle is was a rather steep ravine. They raised the grade quite a bit in that area when they were building the foundations. So im curious for some opinions, I've always preferred steel coasters to wood. Last year I hated Mystic the first time I rode and didn't ride it again until Haunt and then for some reason I loved it. The same with Beast, I did not like it until Haunt and now it's my favorite coaster. Last week we were talking to this guy when we were waiting for beast to come back up and we were discussing rows. When we started liking beast it was when we rode rows 4 or 5. Now we've done front and I like it but my fav seems to be row 2. This guy said we have to try row 17, anyone know anything about this row? I think we will try it tomorrow I'm just leary because I don't like the roughness of the back of most coasters. Thoughts anyone? 17 is my go to spot. But don't spread that around, I don't want people taking my spot, haha. I try to only ride in 17. 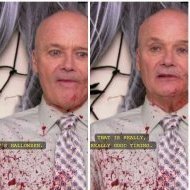 It's just so much better there. I'll ride in any non-wheel seat and the front row though. Ok so what is it about 17? Is it smoother or rougher? More air time? I do have to watch roughness when it snaps going into the double helix, yes technically I probably shouldn't be riding but I've said since my accident that I would rather ride and then to never b able to ride again. I know that sounds horrible but it's true. Since we are in the topic what row is best in mystic? Ok so what is it about 17? Is it smoother or rougher? More air time? It's smoother for sure. I find the pull over the hills is better and it's just more fun. Now that sounds like my kind of ride on it, definitely will try it tomorrow, thanks for the info! I can't wait my best friend from GA will be here tomorrow or Saturday and I cannot wait to see her face on beast! Can anyone tell me if White Water Canyon is running yet? The website is not much help. It was in operation last Saturday. I anticipate a ride on it tomorrow. Unfortunately it looks like I probably will be canceling my hotel booking for Tuesday into Wednesday, weather pattern just is looking way too unstable right now and I am seeing chances of t storms everyday. Hopefully it settles next week. A chance of thunderstorms is actually excellent weather for the park. It keeps crowds away, and even with losing time to thunderstorm shutdowns, you can get more rides in on those days than you can on a day with no chance of rain. It's extremely rare for a chance of thunderstorms to turn into a total washout. Just go get something to eat when the storms approach and enjoy the dead park after they pass. Just like opening day 2018!!! I usually aim for weekdays that have the highest predicted chances of rain each week, and it is very rare that storms last very long, and almost never has the park closed early because the storms are expected to last past the scheduled closing. I've visited a couple times a week when the park is open over the past few years, and there have only been a couple times where storms were persistent or severe enough to send me home. You can cancel your plans if you want to, but you may find that the light crowds are very much worth the need to take shelter for an hour or so during the day. Usually I take it as a much needed break from walking, because I stand in lines so little during the day on rainy days (most things are walk-ons). And, as long as there isn't lightning in the area, most rides still run in the rain. If the temperature is warm enough, it can be quite fun for the entire "dry" side of the park to become water rides. Just grab a raincoat or poncho and enjoy the day! Had an amazing interaction with an associate on Friday (5/11) at the park. It was extremely warm, @pianoman, @Magenta Lizard and I were going to do water rides. I brought a bag of extra clothes for after water rides. Unfortunately, I needed a locker. 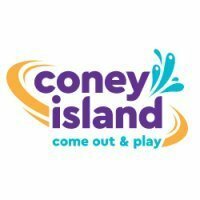 I attempted to purchase an all day locker at the front of the park but each kiosk wouldn’t read my card (I don’t carry cash). After working with the associate near the lockers, the associate got his supervisor, Tanner. Tanner asked me what was going on, so I demonstrated and he attempted to get my card to work. Unfortunately, Tanner couldn’t get it to work. Tanner, however saw that I just wanted my locker and to move on. Tanner ended up getting me a locker for free. I totally didn’t expect that, but it was much appreciated. So great job Tanner and thank you! I did go to guest services and gave him major props. I'll watch the local forecasts more closely tomorrow, obviously lightning I will look out for. They've been so focused on Mother's Day but they should finally be focusing on the weekdays tomorrow. Anyways I'm definitely reconsidering with the comments. I must note though this is going to probably be my only time this year going to Kings Island (besides maybe Winterfest which only one coaster in running). I only went to Carowinds once last year and it was a rainy day, riding some of those rides like Afterburn felt like a total water ride (plus it was in the 60s, not exactly a warm rain). Granted here if it does rain it will be in the 80s so it definitely shouldn't be cold. As long as there are dry periods cause I want to ride Banshee and others dry at least once. We just booked to go Tues and Wed, I'm hoping it won't be too bad for storms and hope it will scare away the crowds. I really can only do it these days as my friend is here visiting and Thurs we want to go to KI for ert night. So I finally did row 17 on The Beast, I hated it so you guys have no worries with your row being taken lol. I thought it was so rough I couldn't wait for it to end and my friend hated it too. Thank goodness we rode row 1 earlier. Just about to leave the station when my friend pointed out there was a raccoon, everyone had to deboard and the ride was shut down, it wouldn't be back up til 1030/1045, a bit too long to wait when we had dogs to take care of at home. Interesting. Just saw this. I did not realize they did this. Likely addressing the Indiana marketing competition with Kentucky Kingdom - KK also has a special deal for Indiana residents. Another great day at KI. FL was all walk ons. Going to have to start giving up Panda express, the last two times I ate it, by the time they hand you your plate and the time you check out the food is cold.. 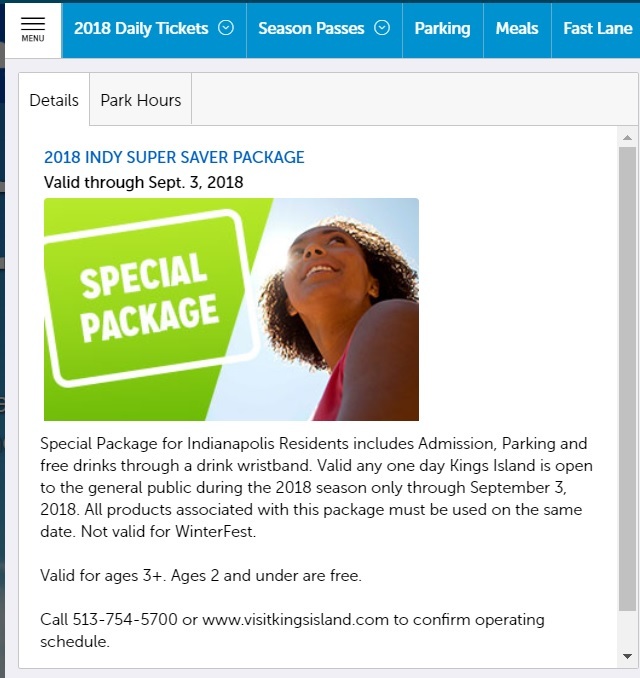 I also would think this would be a direct response to Kentucky Kingdom's $39.99 deal for Indiana residents. 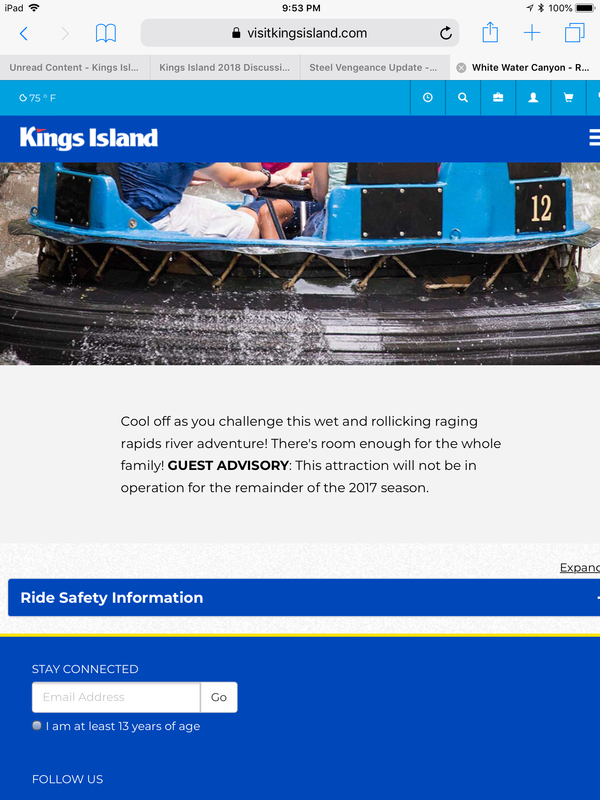 Apparently, KK has been having success with that, so now Kings Island is doing this to counter it, or at least attract more guests from the Indianapolis region. In any case: IMO, this is great news for us, the consumers. Competition is good because it breeds stuff like this, and makes the parks competing add new rides and attractions more often, and forces them to listen more to guest feedback. If we only had 1 major park in the region, it would probably go stale fast, because there would be no real reason to improve. I really am not sure with the weather. It looks indeed Monday/Tuesday it is the kind of weather where isolated PM showers could pop up, hopefully nothing long lasting. I hear Wednesday though it could be more scattered. I'd probably would go if I was set for Mon/Tue instead of Tue/Wed. I could change the hotel date, there are some definitely rooms still available.